To further the science and art of the surgical management of children and young adults with cancer, striving to set a worldwide standard of excellence. To provide an educational forum for surgeons who treat children and young adults with cancer. 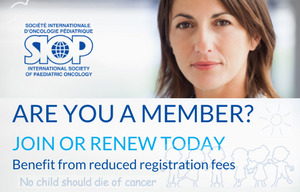 To ensure that each child and young adult with cancer has access to state of the art surgical management, and to encourage global dissemination of best practice, including to parts of the world where IPSO does not have representation. To promote and assist joint projects with other professional organizations, such as co-operative clinical trials, in order to improve the care and outcome of children and young adults with cancer. To advocate for appropriate palliative care strategies and long term follow up for children and young adults with cancer.